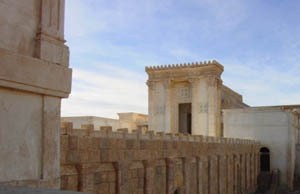 The Jerusalem Temple in the heart of the city. In the decades after Jesus' death, Peter, Paul and others would reach out to peoples and cultures far from their own. They would face skeptics and enemies. But they would also draw converts. Step by step, year by year, they would bring their young Jewish splinter group to one of the most fateful crossroads in history. Learn more about the people and events that shaped Peter and Paul and the Christian Revolution. Read about key figures in The Characters and survey the historical context in the Timeline. Then consult the Bibliography for further reading on early Christianity, or link to related sites through the Online Resources.